2016 ended with a 4-1 thumping of Sunderland to move us up to 11th in the Premier League and now, one year on, we travel to over the roses border and to Huddersfield to bring this year to an end with us four positions higher in 7th. Strangely, no matter what happens at the John Smith’s Stadium, we won’t move up or down the table. We are currently four points behind both Spurs and Arsenal, the two teams directly above us, and we sit six points ahead of the next two below us, Everton and Leicester. We’ve actually now gone three games without a win for the first time this season but that’s probably been lost in the euphoria of Old Trafford where we came so, so close to getting a first win there since 1962 when Andy Lochhead and Jimmy McIlroy both scored alongside a John Connelly hat trick in a 5-2 victory. It really was a sickener at the end when that equaliser went in, but what a performance from our lads, one to savour and including a Steven Defour wonder goal. He doesn’t score many but they are certainly worth waiting for. Now it is Huddersfield, a game every bit as important as the one last Tuesday, and another away game where we will be going looking to win three points. One of our goalkeepers, captain and England international Tom Heaton, was right in front of me at Old Trafford, joining in with the chants and celebrations. His deputy, Nick Pope, who has already kept nine clean sheets since coming into the team, was enjoying another good game. Of his first appearance at Old Trafford, he said: “If you can’t enjoy playing football there, where can you enjoy playing? It’s something, since I came into the team, I’ve been determined to do. Jesse Lingard robbed him of a chance to take his clean sheets into double figures but he now faces a Huddersfield team against whom he did just that in a 0-0 home draw earlier in the season. With Heaton still some weeks away, Pope will remain first choice, certainly for a while yet, and he’ll continue to line up in front of a much changed defence. Phil Bardsley has retained his place at right-back having recently come in for the injured Matt Lowton who has had to contend with a place on the bench recently. James Tarkowski (suspended and injured) and Stephen Ward (injured) remain out of the reckoning which will see Kevin Long and Charlie Taylor continue. Chris Wood, however, could be fit, but I suspect Sean Dyche will continue with Ashley Barnes with Wood, if he is available, potentially going on the bench. I think we’ll line up: Nick Pope, Phil Bardsley, Kevin Long, Ben Mee, Charlie Taylor, Jόhann Berg Guðmundsson, Steven Defour, Jack Cork, Scott Arfield, Jeff Hendrick, Ashley Barnes. Subs from: Anders Lindegaard, Matt Lowton, Ashley Westwood, Dean Marney, Fredrik Ulvestad, Nahki Wells, Jon Walters, Chris Wood, Sam Vokes. Huddersfield won promotion last season having won the play-offs with penalty shoot out wins against Sheffield Wednesday in the semi-final and then Reading in the final. The promotion ended a long run without top flight football at Huddersfield which they’d last enjoyed in the 1971/72 season when, after two years back, they were relegated alongside Nottingham Forest. While we were scoring three goals on the opening day of the season at Chelsea, they were doing likewise at Crystal Palace and without conceding. Palace’s Joel Ward opened the scoring with an own goal with Steve Mounié scoring twice to complete the scoring. It was almost as big a surprise as our win, but I don’t think anyone had considered that Palace might be that poor under Frank de Boer. Huddersfield continued with a 1-0 home win against Newcastle and then kept a third consecutive clean sheet in a 0-0 draw against Southampton. That draw was the first of a run of six games without a win but generally they’ve done well and the lowest they’ve been in the league is 15th and that came at the beginning of December after a run of four defeats. But they are a team in form right now with only one loss, and that against Chelsea, in the last five games with their most recent win coming at Watford where they won 4-1 on an afternoon when Michael Oliver took centre stage. Manager David Wagner has confirmed they have no injury problems other than Chris Löwe (pictured) but he will be available as he continues to play through a foot problem. Their team on Boxing Day when they drew 1-1 at home against Stoke was: Jonas Lössl, Chris Löwe, Christopher Schindler, Mathias Zanka, Tommy Smith, Jonathan Hogg, Aaron Mooy, Rajiv van La Parra, Tom Ince, Collin Quaner, Steve Mounié. Subs: Joel Coleman, Martin Cranie, Florent Hadergjonaj, Danny Williams, Scott Malone, Joe Lolley, Laurent Depoitre. We arrived at Huddersfield in March 2016 having won the previous five games against Rotherham, Nottingham Forest, Bolton, Blackburn and Fulham. There was never any danger of us not making it six. A left wing corner from David Jones found Michael Keane at the far post. His knock down was hooked home by Stephen Ward (picture below). We were 1-0 up after a quarter of an hour and that lead was doubled after 30 minutes when George Boyd crossed low from the right for Sam Vokes to turn in from close range. This was an outstanding performance but there was a shock just before half time when Joe Lolley pulled one back for the home side but we still went in to half time with a two goal lead. From the restart we went straight down and won a corner, this time on the right. Jones again was the provider, this time Ben Mee heading home. Embed from Getty ImagesHuddersfield did try to step things up in the second half. They hit the post, but had it been going in, Tom Heaton had it covered, and Sean Scannell badly failed to get onto one good ball in the box. Generally, though, we looked comfortable and while there were no goals in the second half we were easy winners. I considered it reminiscent of the Charlton game two years earlier when we went to the Valley and won 3-0. I wrote in my report that the performance had promotion stamped all over it. As I left the ground that day I thought we were heading back to the Premier League. There were one or two scares on the way but five wins and four draws from the remaining games so us comfortably through to take the title. 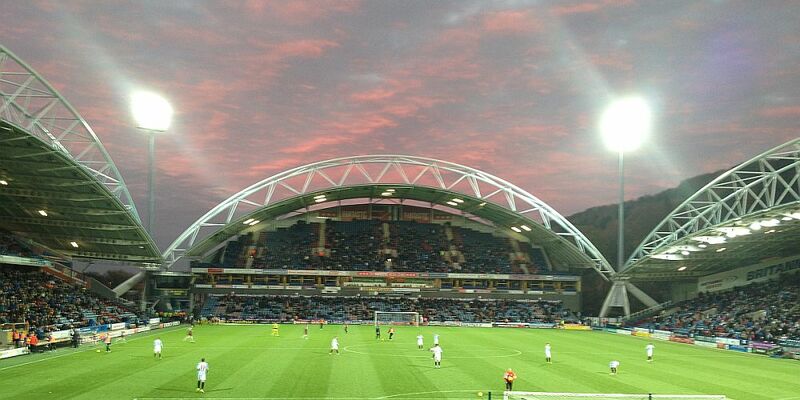 Huddersfield: Jed Steer, Tommy Smith, Mark Hudson, Martin Cranie, Jason Davidson (James Husband 84), Dean Whitehead, Emyr Huws, Tommy Smith, Joe Lolley, Karim Matmour (Jamie Paterson 56), Sean Scannell (Harry Bunn 55), Nahki Wells. Subs not used: Joe Murphy, Kyle Dempsey, Joel Lynch, Flo Bojaj. Burnley: Tom Heaton, Matt Lowton, Michael Keane, Ben Mee, Stephen Ward, George Boyd, Joey Barton, David Jones, Scott Arfield (Michael Kightly 75), Sam Vokes, Andre Gray (Rouwen Hennings 85). Subs not used: Paul Robinson, Tendayi Darikwa, James Tarkowski, Dean Marney, Matt Taylor.